The human body possesses the remarkable ability to temporally and spatially coordinate the hands and body to achieve an infinite number of action goals. Whether engaging in a seemingly pedestrian action, such as tying one’s shoelaces or reaching for a glass of water, or a more complex action, like playing a Chopin mazurka or performing an intricate dance sequence, your brain must transform an action goal into a movement program that instructs the appropriate limbs how, when, and where to act. The research performed in our lab focuses on how the brain represents and executes action goals in various contexts and how the brain makes sense of other people’s actions. We use a variety of tools and methodologies to gain insight to the neural processes that subserve action-related cognition. For example, the picture on the right shows a subject reaching for an object which will rotate as she grasps. 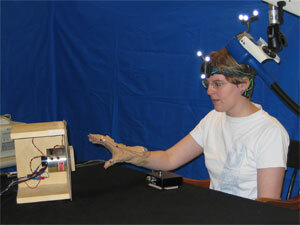 A polaris tracking system is used to align the transcranial magnetic stimuluation coil on her head with a high resolution image of the her brain, and optotrack markers are used to record the how her hand moves. We can use this type of experiment to assess the temporal and functional contributions of different areas of cortex to reaching grasping tasks. We are also a neuroimaging lab, and are fortunate to have access to the in-house fMRI scanner at the Dartmouth Brain Imaging Centre right here in Moore Hall. Presently, we are waiting for the new 3T scanner to be installed and ready for scanning. Read more about our recent research on the publications page.